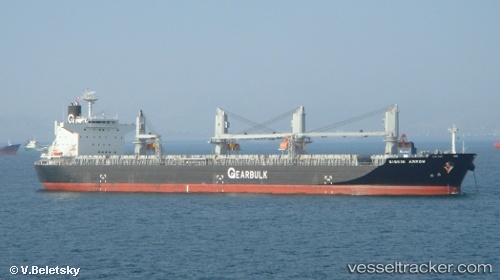 Mitsui Engineering & Shipbuilding Co., Ltd. (MES) completed and delivered a 72,800 dwt type Open Hatch Jib Crane General Cargo Carrier "SISKIN ARROW" (MES Hull No. 1839) at its Chiba Works to Misuga S.A., Panama, on January 21, 2014. This is the 4th vessel of its series which has a large cargo hold capacity of more than 86,600 m3 with 8 box-shaped cargo holds. The 210 metre long vessel is one of the largest open hatch general cargo carriers in the world with eight (8) box-shaped cargo holds and four (4) jib cranes for handling cargo. The vessel has three (3) pairs of piggyback-type hatch covers to enable large hatch openings.